A dog tortured by acid. Oman is a peaceful a quit country where the people have respect for each other.To my surprise i heard of a story that some individuals harmed wadi dog by throwing acid liquid on him causing serious burns of the skin.The dog has been found by a local resident who immediately rushed to Azaiba where the vet treated him. We need more education and more respect for animals in Oman.I know the things work different here compared to Europe where the animals have more rights and the law protect those who abuse them.Nobody should kill,harm or abuse the poor dogs and cats without any reason or for fun.It’s a matter of education and respect. 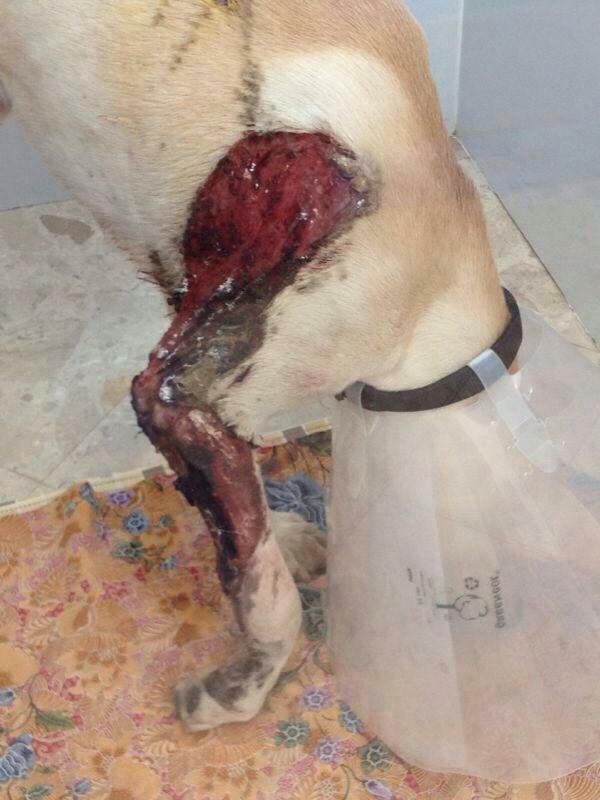 The picture below has been taken from local FB group aiming to protect animals in Oman. This entry was posted in Uncategorized and tagged dogs in Oman. Bookmark the permalink. 1 Response to A dog tortured by acid. Actually I was in the pet care yesterday 6/11, taking my dog for cleaning ears and I saw that poor wadi dog their and one of the workers told me what happened to him and the other small puppy died , and she said that he is fine now ( i mean what u can see in the photo is better that the first time ) but when somebody brought him to the vet , oh my God. He is recovering but he need many months to get back to his health, he is even don’t have a skin and u can see the bone of his leg. He was so friendly and happy to see somone who care about him after his suffer.